Diego Simeone has extended his contract with Atletico Madrid, which will keep him in the Spanish capital for the next five years. 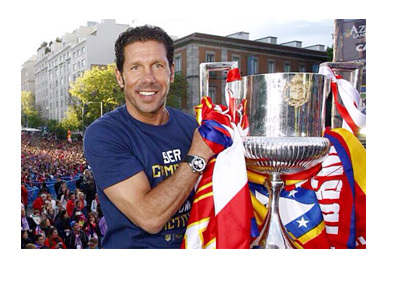 Simeone is responsible for Atletico's transformation from a non-entity in Spanish football to a European superpower - Europa League winners in 2012 - La Liga champions in 2013-14, winners of Copa del Rey in 2012-13, Supercopa de Espana in 2014 and runners-up in UEFA Champions League in 2013-14. In his first four years Simeone has rebranded Atletico and improved the club's financial situation. He has pushed several players to become world stars and it is no wonder his team gives it their all every time they play. The 44-year old Argentine was a Atletico player himself from 1992 to 1997 before he took over managerial reins of the club in 2011. Manchester CIty had evinced strong interest in Simeone, but the new deal with his existing club has put paid to the hopes of the Premier League suitor. Simeone's desire to stay on with Atletico is reflected amply by his delight at having entered the Round of 8 in the UEFA Champions League again. He says that it gives him goose bumps to realize that his team is among the eight best in Europe now. But Atletico's current run of poor form in the La Liga where they have dropped to the fourth place after three consecutive draws and just one win in their last four games, will need a lot of mending going into April's UEFA clash with city rivals Real Madrid. Surely, the club will need the energy of someone like Diego Simeone at that time. The word on the street is that Diego Simeone, for a change, will not need to sell his best players in the summer now that a Chinese conglomerate has purchased a 20% share in the club.